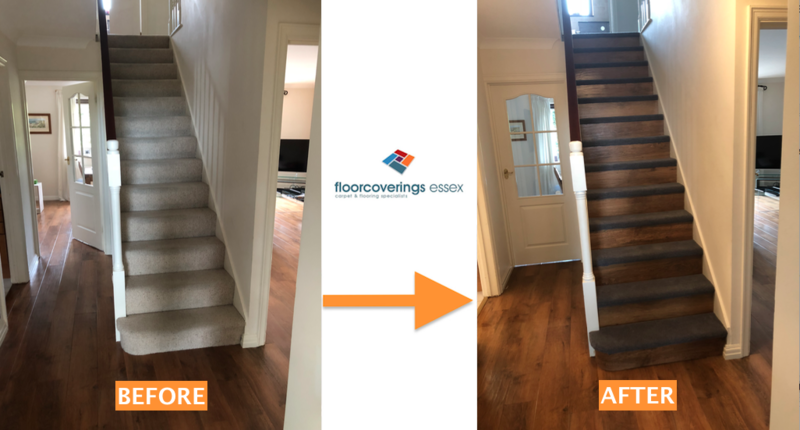 Following our recent Before & After blog about LVT flooring, we wanted to show you the process of a stairs and landing fitting. 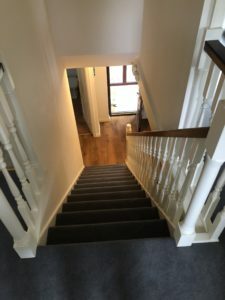 This particular job is unique as the customers chose to go with a trendy combination of having vinyl planks installed on the risers, with a carpet to compliment on the stair treads and the landing. 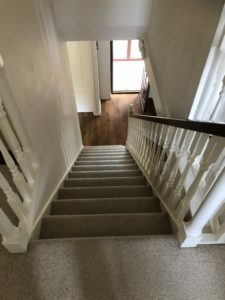 This job was completed and photographed by our fitter, Pete, who initially started as an apprentice with us eight years ago and has worked his way up through professional training courses and exams to become an excellent, highly regarded fitter. 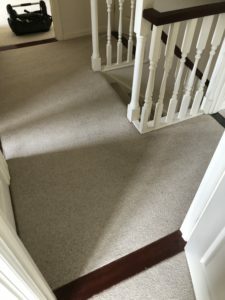 Pictured above are photos of the previous beige, loop-pile carpet in this customer’s property. 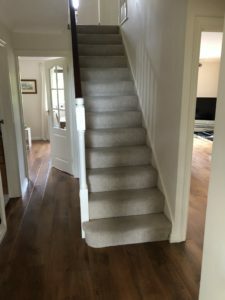 Not a bad carpet by any means, but a more modern, luxurious look was certainly achievable. 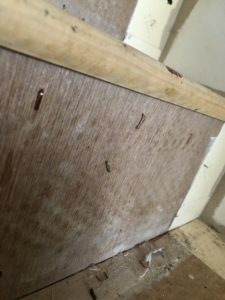 There were some staples that had been used in the last installation that needed to be removed. Also, a few extra strips of gripper and some shiny new door bars went in, then it was good to go. 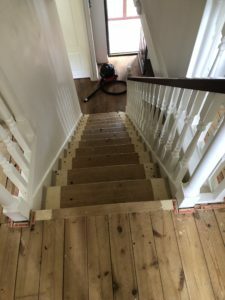 Pete began by cutting in and sticking the vinyl planks on each riser of the staircase, immediately giving the stairs a refreshing lift. 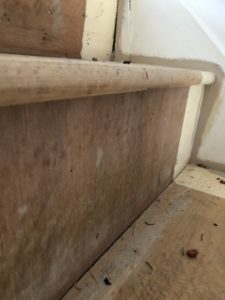 He then carefully laid a dense, high quality PU foam underlay on the treads and the landing. 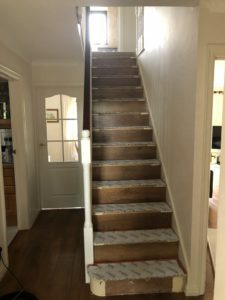 Having a good underlay is essential in areas that get a lot of footfall, without it your carpet will suffer much more wear and tear and will need replacing in much quicker time! 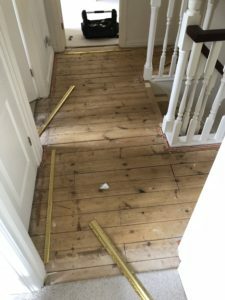 After this, it was time for the carpet to be fitted. 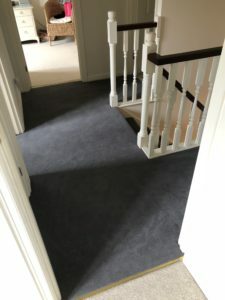 Our customers chose an on-trend, deep grey, soft feel carpet that is also hardwearing and easy to maintain. 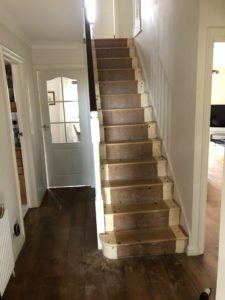 Combined with the underlay, this will provide an aesthetically pleasing and well-insulated flooring solution for years to come. 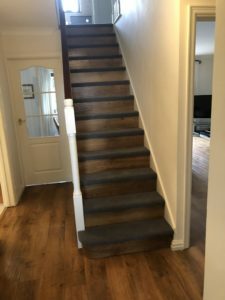 If you like the look of these products, which can be installed in any area of the home, the LVT is from Karndean’s Art Select range and the carpet is from a range called Vivo Oval. Many other colour options are available.